It's an unavoidable fact that when most people think of “the Gold Coast”, what they are really imagining is actually Surfers Paradise – that highrise-filled, sunny-beached, party-centric hotspot that is the staple of postcards worldwide. While many people know of Surfers Paradise, that's often not the case when looking for the best things to do. 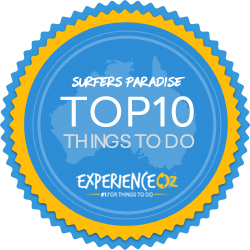 We've thus put together the below list of the Top 10 Things to do in Surfers Paradise with our recommendations on the can't-miss activities and attractions in “Surfers” for first-timers from both Australia and abroad - all of which are within walking distance of one another. Surfers Paradise didn't earn its name without reason, and while it might seem obvious to grab your swim gear and head straight down to the water at the end of Cavill Avenue (Surfers Paradise's main street), there's a little more to it than that. The main section of Surfers Paradise Beach is easily recogniseable due to its large “Surfers Paradise” sign that is always a popular feature in photos for visitors looking to strike a pose, and the area beyond it is a regularly-patrolled beach area with vigilant lifeguards who are kept busy watching over often-careless tourists. The foreshore area along Surfers Paradise beach has recently also undergone a multi-million dollar facelift, and now is a much more impressive area to simply “hang out” than it ever has been before; there are plenty of new public showers, toilets, seats and more that make rinsing off or relaxing far more enjoyable than before. The beach is made even more popular due to the fact that it's within easy walking distance of most Surfers Paradise accommodation, coupled with the fact that there are many fast food and more high-end dining cafes and restaurants just across the street. The foreshore area along Surfers Paradise beach has recently also undergone a multi-million dollar facelift, and now is a much more impressive area to simply “hang out” than it ever has been before. If you're looking for more of a relaxed, uncrowded beach atmosphere however (particularly if you're a family with younger kids), it's advisable to head 10 minutes' walk or so either south or north to one of the nearby patrolled – but not nearly as busy – areas of beach towards either Broadbeach or Main Beach. While it's perhaps not the “perfect” beach on the Gold Coast as far as surf goes despite its name, Surfers Paradise beach is still a very viable spot for boarders who aren't too fussy about catching the ultimate wave, with a decent break that tends to produce waves that hover around the 3-4 foot mark most of the year. As a result, surfing lessons are hugely popular with visitors who are looking to take the first steps towards learning to surf, and the beach's relatively moderate waves make it a great place to do just that. As with most cities, no visit is really complete without visiting their top viewing tower (assuming they have one), and the Gold Coast is no exception. The Q1 building is the Surfers Paradise answer to this, and while it's not quite as tall as some traditional “tower” type structures, it's still the place that offers by far the best views of the Gold Coast. The SkyPoint Observation Deck sits atop the 77th floor of the Q1, which places visitors roughly 320 metres above the ground and provides views that stretch (on clear days) from Byron Bay in the south to Brisbane in the north befitting of its status as the tallest residential building in the Southern Hemisphere. The deck itself is accessed by one of the fastest elevators / lifts you'll likely come across, and it's quite incredible as to how fast you actually ascend to the top. Once up top, you'll have access to some uninhibited 360 degree views of the Gold Coast hinterland, golden coastline, city skyline and vast stretch of the Pacific Ocean out to the horizon. Once up top, you'll have access to some uninhibited 360 degree views of the Gold Coast hinterland, golden coastline, city skyline and vast stretch of the Pacific Ocean out to the horizon. The SkyPoint deck also comes with a fully equipped bar and restaurant that makes for an outstanding spot to grab a drink, with the place even becoming a fully-fledged nightclub once the evenings roll around. Since the beginning of 2012, the Q1 building also offers their “SkyPoint Climb” experience that allows guests to climb outside the building and embark on a harnessed journey around its glass exterior. Coupled with interesting commentary provided by the climb guides, it's one of the more unique experiences to be had not just in Surfers Paradise, but on the Gold Coast as a whole. The SkyPoint Deck is an ideal starting point for first-timers to the Gold Coast that allows the opportunity to get your bearings and more of a sense of where everything prominent is located, so if you're new to the city then be sure to put this near the top of your list. One of the most unusual, yet common, sights that many first-time visitors to Surfers Paradise will notice are the series of huge “duck” vehicles that can be seen rolling around the city streets. They've become a popular staple of the city, forming a well balanced tour by taking visitors both through the heart of the city itself and then out onto the Gold Coast Broadwater where they can take in the sights from a completely different angle. Conducted via amphibious-style military vehicles that have been re-branded with colourful duck-themed paintjobs, the ducks are massive vehicles that sit high up and thus provide a great viewing position for their passengers. While they're not exactly speedy on land, their ability to slip smoothly into the water makes for a unique activity that few people will have done previously in their lives. They've become a popular staple of the city, forming a well balanced tour by taking visitors both through the heart of the city itself and then out onto the Gold Coast Broadwater where they can take in the sights from a completely different angle.. They are always a favourite with the kids, and the staff of the various Ducks - there's AquaDuck and Quack 'r' Duck to choose from - do their best possible attempt to cater for the little ones and prevent them from getting bored or distracted throughout the tour – the driver may even let them briefly hold the wheel while on the water. For adults themselves, there is plenty of commentary and sightseeing trivia to take in, as well as great photo opportunities of the various regional highlights along the way. This is definitely a must-do in Surfers Paradise for families and easily to recommend as a starting point if you've got children along for the ride. One of the first facts you'll no doubt discover from doing any sort of tourism research on Surfers Paradise is that the city's canal system is longer than those of both Amsterdam and Venice combined, and it shows. The extensive waterways carve a wonderful sightseeing path through the “back side” of the city, and allow viewing parts of the area that would otherwise be inaccessible - including some truly ritzy waterfront housing. Taking a cruise here is thus highly popular, and various operators populate the area that offer different morning cruises with coffee and cake, buffet lunch cruises, afternoon savoury tours or even dinner cruises – the choice of which will simply depend on what you're looking for. Regardless of choice, you'll get to see some of the impressively extravagant mansions and other waterfront highlights that the Surfers Paradise area has been put on the map for, as well as local attractions such as Sea World, Marina Mirage and more. There are also plenty of cruises that go a little further from the city, taking guests to such popular local destinations as Wave Break and South Stradbroke islands for a bit more of a combined on-and-off-shore experience. 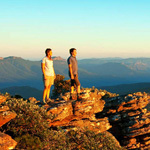 Many of these offer packages that incorporate full-day tours as well as meals, entertainment and other activities – or even entry to one of the most popular theme parks In the region; this great variety in Surfers Paradise cruise choices means that the only limit will be your wallet and budget. Surfers Paradise has earned its reputation as one of Australia's go-to party destinations after a long history of constructing various hospitality based business, which led to a huge variety of nightclubs and bars that can all be found within walking distance of one another. It's perhaps the country's top spot to "let loose", with nightclubs that vary from the laid back to the borderline raunchy, and the majority of which are located within the hubs of both Cavill and Orchid Avenues. While they all have varying degrees of cover charges - you'll typically get free entry only if you enter earlier on in the night - pricing is similar across the board in terms of drinks, so choice of club downs to personal preference. Exactly which one is “the place for you” will be almost entirely dependent on some combination of your age, musical preference and relationship status, as each Gold Coast nightclub offers something slightly different. As far as bars go, there's also a fairly wide selection, the majority of which are large establishments rather than smaller inn-style taverns. Large Irish-themed bars are the name of the game in Surfers Paradise, with Waxy's, Fiddler's Green and – our pick of the lot solely because of great waterfront views – O'Malley's on the esplanade. During your time out, be sure to keep in mind that due to government regulations, all clubs and bars are now required to “lock out” guests from entry from 3:00am onwards in an attempt to curtail drunken street violence, so if you're planning to pull an “all-nighter”, be sure to get inside your club of choice beforehand. Whether you're looking for a wild night out or to chill with friends and soak up some live music, the Gold Coast's nightlife scene will be sure to meet your needs. 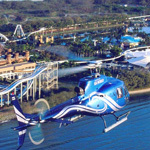 As you might have guessed from the above items on the list so far, Surfers Paradise is a travel destination that's all about the water, and for those of you who are looking to add a little zest to the proceedings, jet boating is another hugely popular choice. Strapping yourself in to a turbo-charged boat, you'll head out first slowly and then at an increasing pace until you're performing a variety of stunts - it's a fun and refreshing rush for hot days in particular that still offers inherent sightseeing opportunities. The aforementioned expansive waterways of the Gold Coast make for ample space for jet boating operators to ply their trade and give their guests some high-speed, on-the-water adventures in and around Surfers Paradise's surrounds. Perhaps jet boating's biggest positive is that it adds a hint of adrenaline without being too extreme, meaning that families can still participate while still providing a refreshing change of pace from some of the slower tour alternatives. Typically, the tour operator will take you out on the water at a gradual speed while pointing out some of the regional highlights before picking up the pace, letting the jet boat's twin-turbo engines kick in and performing a series of high-speed spins, slides, power stops and more. One thing to note about jet boating however is this: regardless of where you're sitting, you WILL get wet. Be sure to dress or plan accordingly (especially in case you'll be sitting on the end of a row and therefore exposed to a maximum splash-factor!) It's also a very good idea to wear sunglasses as the salt spray can sometimes get into your eyes and provide a bit of a sting if you're unlucky. With the likes of the Gold Coast Broadwater, Stradbroke Island, Marina Mirage and the ritzy Sovereign Islands potentially on the itinerary, it's a great sampler of some of Surfers Paradise's surrounds with family-friendly fun mixed in. One of the more unique and mind-bening attractions on the entire Gold Coast can be found quite literally in the heart of Surfers Paradise. Sitting in the popular Chevron Renaissance boutique shopping area, Infinity Attraction (or simply Infinity) is an exercise in visual trickery and optical illusions divided up into various different sections, each of which aims to play a different game on your senses. Easily accessible by public transport, Infinity is an attraction that's suitable for adults mainly has (young-ish-but-not-too-young) kids and teenagers in mind, with a variety of “mazes” and other trickery in each room. Some feature hands-on exhibits that confuse your senses of sight and touch, while others will see you walking over "imaginary bridges" that gives the sensation of walking through space! Sitting in the popular Chevron Renaissance boutique shopping area, Infinity Attraction is an exercise in visual trickery and optical illusions divided up into various different sections, each of which aims to play a different game on your senses. In addition, it's an attraction that can be done simply "on a whim" as it's typically in the walking path of Surfers Paradise visitors grabbing a coffee or bite to eat near the main dining hub of the suburb - as Infinity is not a time-consuming attraction it's an easy way to satisfy bored or complaining kids. Those looking for something different and who enjoy having their perception stretched a little bit will appreciate what Infinity is trying to do, however it has been known to get a little uncomfortable for those who easily get either motion sickness or claustrophobic. The bottom line is if you're after something that stands out from the rest of the things to do in Surfers Paradise that's far less of a “token sightseeing” adventure, then Infinity is a great choice - and, as mentioned, it's also situated in an ideal location for you to. “Surfers” wouldn't be “Surfers” without its shops, and while it isn't home to a large shopping mall or complex (you'll have to travel around 10 minutes south on the Gold Coast highway to Broadbeach's Pacific Fair for that), there are a huge range of boutiques and other small stores selling everything from cheap souvenirs to high-end brand accessories and electronics. While the main nightlife and dining district of Surfers Paradise is without a doubt Cavill Avenue, if you're looking to do some shopping you'll likely want to explore either the Surfers Paradise Boulevard side of the area or the newly redeveloped Hilton “High Street” complex that features a number of brand stores such as Versace, French Connection, Prada, Gucci and other boutiques and retail outlets. Along with these retail boutiques are several higher-end dining options and restaurants as well, serving everything from standard cafe fare to specialty sushi delicacies. While the face of Surfers Paradise retail scene is ever-changing with stores coming and going, there's plenty of opportunity to get a dose of detail therapy right near the majority of the suburb's accommodation without having to resort to public transport. Further along the north end of the main Surfers Paradise central district are more – for want of a better word - “tacky” options, centering around bargains and other knick-nacks where one can grab a memento of their trip to the Gold Coast. Add in a sprinkling of new Asian-themed restaurants down a number of dedicated dining streets sprouting up all the time, and you'll be spoiled for choice for a quality bite to eat within Surfers. From the months of June to the beginning of November, there's one activity in particular that's a must do if you happen to be on the Gold Coast, and that's whale watching. The humpback whales' annual migratory period combines with the numerous access points to the ocean that the Gold Coast provides to make it one of the best spots to see these gentle ocean giants up close, and with numerous operators to choose from you'll have a selection of day and time combinations to choose from during peak season. Gold Coast whale watching tours allow travellers to head out on the water aboard stable, purpose-built whale watching vessels that provide excellent viewing angles of the whales as they take a rest and care for their young. Seeing the humpbacks breach and play in their natural habitat just outside one of the most popular sightseeing districts in the country is an advantage for Surfers Paradise that few other “big name” areas of Australia have. Employing top of the range whale finding equipment, it's never too long a trip before the whales come into view. Depending on the month you travel - and a little bit of luck of the draw - they're never too crowded, either so you'll be able to have a decent outlook at the massive marine mammals as they're seen right alongside the boat.. The majority of tours operators divide their trips out onto the water into morning and afternoon sessions, giving both early risers and those who prefer a sleep in the chance to see the whales when they'd like. 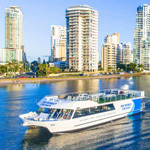 Regardless of if you're heading out early or late – or choosing one of the available lunch cruise options – seeing the humpbacks breach and play in their natural habitat just outside one of the most popular sightseeing districts in the country is an advantage for Surfers Paradise that few other “big name” areas of Australia have. Lastly, we tip our hat to a popular shrine to all-things-odd, with Ripley's Believe it or Not being one of the oldest and longest-running attractions right in the heart of Surfers Paradise. Dubbed the “Odditorium”, Ripleys offers a smallish and compact, yet entertaining and intriguing glimpse into the weird and wonderful. 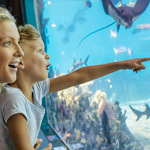 As with many of the other things to do in Surfers Paradise (and most other tourism-focused cities around the world, it must be said), Ripleys aims to be entertaining for the kids – and who knows, they may even learn something - while also providing numerous tidbits for adults as well. It's an attraction that's likely better suited for kids years 10+ as younger ones won't likely have the patience or interest to appreciate the facts and information on offer; they're only "fascinating" if the mind can grasp them, after all. Some of the attractions inside also may be slightly scary for little ones as there are encounters with skeletons, mannequins and other slightly spooky featurettes contained here. Dubbed the “Odditorium”, Ripleys offers a smallish and compact, yet entertaining and intriguing glimpse into the weird and wonderful. There are a couple of interactive sections at Ripley's as well in addition to the static displays, such as a laser maze section which is challenging to cross (do your best Mission: Impossible impression! ), games for kids, and props which reveal trivia when used. As an interesting side-quirk, they also now offer a free, downloadable app for smart phones that serves as a companion to the experience, offering further information, details and background about each of the exhibits on display. While the tour only takes as long as you want it to (it's sold as being “self-guided” after all), Ripleys presents quite good value for money when visited on a whim, especially compared to the price of other things to see and do in the heart of one of the busiest tourism centres in the country.